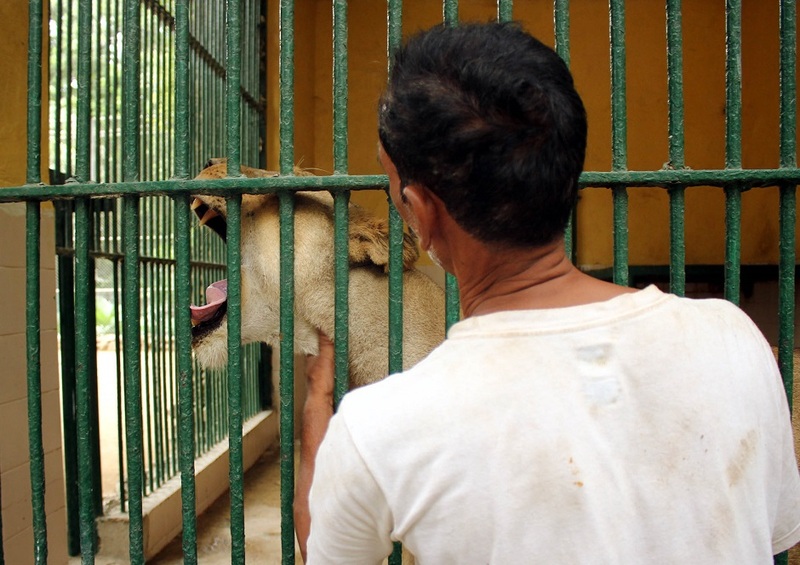 Kannu Piraditta lovingly scratches the back of Raja – the lion – through the metal bars of his cage at the Karachi Zoo. The king of the jungle playfully rubs his back against the bars, before bowing his head to let Piraditta scratch behind the ears. As proof, Piraditta approaches the cage housing chimpanzees, who quickly respond to his beckoning and climb onto the bars to let him pet them. Among the zookeepers’ fraternity, Piraditta, who has been in the profession for over two decades, holds special regard as one of the most experienced wardens. 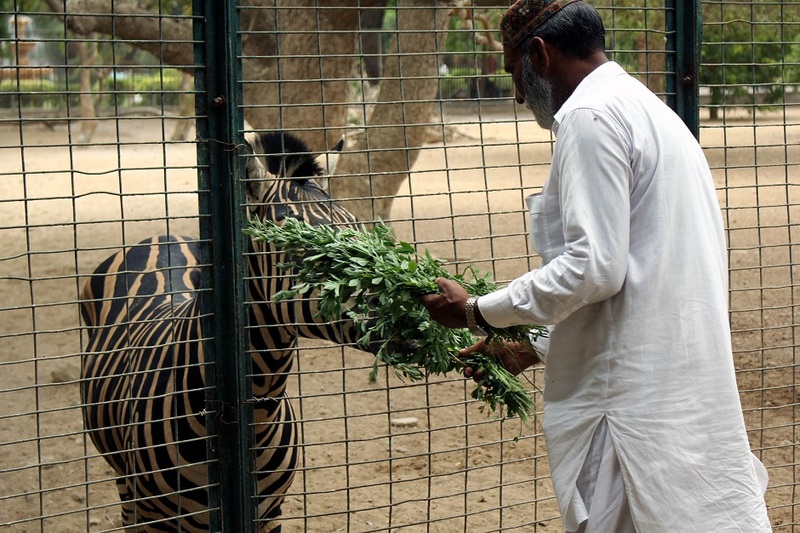 At the Karachi Zoo, he cares for the lion, Bengal tigers, pumas and chimpanzees. Typically, this involves feeding and bathing routines. Occasionally, Piraditta plays with them by patting and rubbing his body against theirs through the bars. For all the love, though, Piraditta knows well the risks associated with coming into close contact with the animals. He has been attacked in the past, he says, before quickly adding, “These wild animals want love much as we do.” For the risk he takes, the government pays him Rs 50 as a ‘risk allowance’. Shaamu Narain joined the zoo around the same time as Kannu. That was in 1997. Now, he cannot imagine a life without the animals. “It’s my duty to serve animals but our religious beliefs also bind us to take care of animals to get their blessings,” he says. Narain is a member of the Hindu community, and as such, he holds the animals in special regard, he says. “I sometimes go inside the female monkey’s cage,” Narain says as he observes the monkeys. “They usually get very aggressive when they are rearing a baby but she still lets me come inside her cage to play with her and her three-month-old-baby,” he says. Besides monkeys, Narain cares for various other animals. The monkeys and elephants are special, though, as Narain’s faith teaches him to show reverence towards them. There are currently 20 zookeepers at the facility to look after the hygiene, sanitary and dietary requirements of the around 850 animals housed in the zoo. Almost as many posts for zookeepers have been lying vacant for some time. “Zookeepers are the backbone of any zoo and their job is to engage with and observe animals in captivity lest they start showing signs of abnormal behavior,” the head of the facility, Muhammad Mansoor Qazi, said. They [zookeepers] note the daily routine of the animals as well as their breeding cycles or medical condition, Qazi explains. 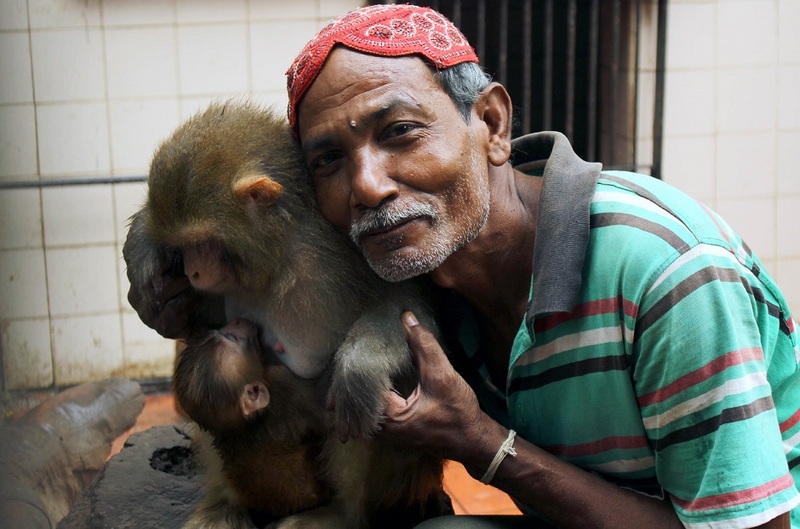 According to Qazi, zookeepers are typically assigned to care for specific animals for years on end to create a bond between the keeper and the caged animal. “Members of the Hindu community have high regard for elephants, snakes, monkeys and other animals and hence prove to be good zookeepers. There are also a few Christian and Muslim zookeepers who fill in for their colleagues over religious holidays. According to head zookeeper Rajesh Singh, the animals at the zoo develop a warm relationship with their keepers over the years. The big cats, chimpanzees, bears and crocodiles are, however, dealt with care and no zookeeper is allowed to come into direct contact with them by entering their cages without proper precautions. The zookeeper of bears is Khiraj Alaram while hundreds of ducks are looked after by Raju. 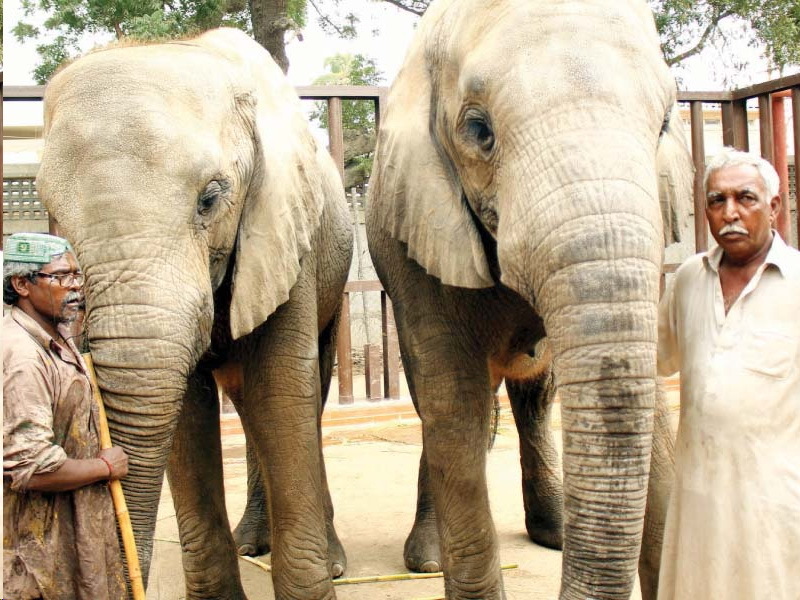 Yousaf Masih, the chief mahavat (elephant keeper) has trained four elephants, two of whom now live at the Safari Park while Madhu Bhala and Noor Jahan. 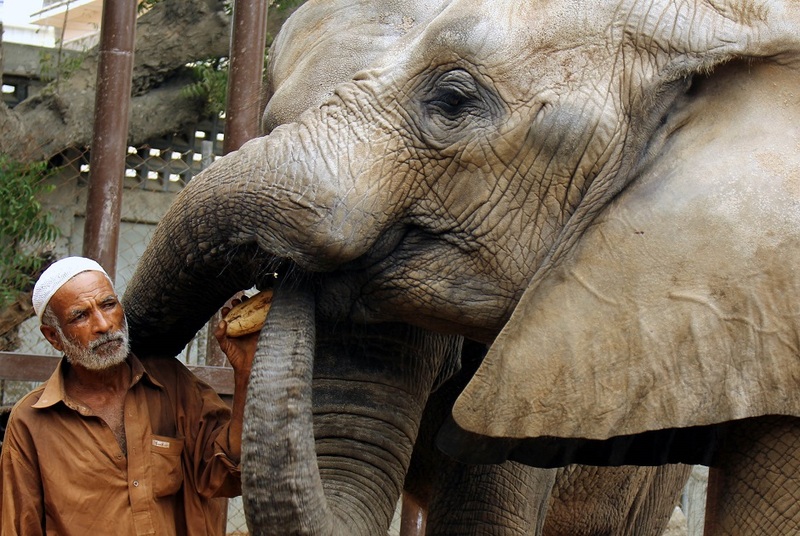 Love is their language, says Amir Aziz, who oversees the zoo’s day-to-day operations. Unfortunately, he adds, love is not always what they receive from visitors, who often try to harrass them by pelting stones and empty bottles inside the cages. “This puts both the animal and the zookeeper at risk because the animals then tend to react aggressively,” he says.